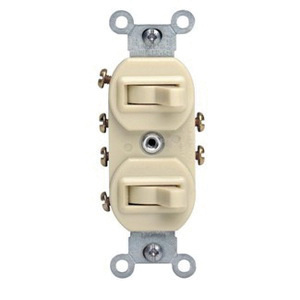 Leviton Commercial grade two 3-way AC combination switch device in brown color, is current rated at 15-Amps and voltage rated at 120/277-Volt AC. With dielectric strength of 1500 Volt/1 min, the toggle actuator switch. This traditional duplex non-grounding switch has thermoplastic body and actuator and accommodates 14-12-AWG terminal. The side wire connection switch has steel strap and withstands a temperature rating of -40 to 65 deg C. The switch has a dimension of 4.2-Inch x 1.62-Inch.